Video search giant Blinkx has announced it is teaming up with Evri, offering video through the company's myriad phone apps. Evri has been busy of late, expanding into the mobile world to deliver real-time content on a number of different categories. 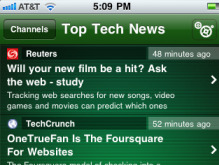 It is launching five Android and iPhone apps this week which range from technology, celebrity news to music. These apps will also deliver oodles of video content and this is where Blinkx comes in. The video search engine will be used in the EvriThing applications, offering up its mobile video index to the apps and with it millions of videos. Suranga Chandratillake, founder and CEO, blinkx, said about the link-up: "Video streaming is the fastest-growing mobile activity, and there's a tremendous consumer demand for rich media apps. "Evri's unique technology enables them to deliver a highly compelling multimedia experience to mobile audiences, and we're delighted to be powering the video component of their new suite of apps." Real-time content is an area which is burgeoning in the mobile market, so it will be interesting to see how well Evri and Blinkx get on.